This paper applies a multivariate threshold model to estimate a country�s threshold level of economic tolerance (c) and delay of response (d) to the impact of a positive price change and its shock. 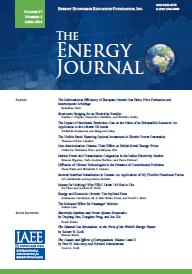 Regression analysis is employed to investigate the factors affecting c and d. We find: (1) as a country becomes more advanced in economic development and acquires a lower ratio of energy use in its industry and transportation sectors, the threshold of tolerance is greater as evidenced by the positive impact of an oil price change and its shock; (2) if a country has a lower ratio of energy use in the industry sector, a lower energy import ratio and is more advanced in economic development, it will have a longer delay; and (3) as an economy becomes more advanced, the length of the response time from the impact of the shock of an oil price change will be longer. Export responses to unanticipated price shocks can be a key contributing factor to the rapid mean reversion of electricity prices, a phenomenon often seen in electricity markets. In this paper, we use event analysis to demonstrate how hourly export transactions respond to negative supply shocks in the Ontario electricity market. Although event analysis has been used for many years in other applications, particularly finance, to our knowledge this is the first time that this technique has been applied to price response analysis in the electricity market. The analysis clearly demonstrates the sensitivity of export volume to price changes, and more generally, the responses of prices and quantities to an unexpected supply shock. High oil prices and gradual resource depletion have raised global concerns for security of energy supply. Successful exploration activity is a critical factor for future oil production. Based on standard neoclassical producer behavior and modern time series econometrics, this study reveals new insights into the process of oil and gas exploration. I find that reserve additions are enhanced by an increase in the oil price, due to responses both in effort and efficiency of exploration. Moreover, oil companies accept higher exploration risk in response to an oil price increase, implying lower success rates and higher expected discovery size. The paper examines the dynamic relationship between pairs of four oil benchmark prices (i.e., West Texas Intermediate, Brent, Dubai, and Maya), which have different physical properties and locations. The results indicate that there is a long-run equilibrium relationship between different benchmarks, regardless of their properties and locations. More importantly, there is asymmetry in the adjustment process that is specifically modeled and implications are discussed. Does urban form affect travel choices and thus CO2 emissions by individuals? If this is the case, then urban form and policies that influence it deserve serious attention in the context of long-term climate policy. To address this issue, we examine the impact of urban density on commuting behavior, and the consequences for CO2 emissions. The empirical investigation is based on an instrumental variable approach (IV), so as to take account of endogeneity of residence location. We decompose travel demand into components related to modal split and commuting distance by each mode. This paper explores the economies of scale and scope in the electricity, gas and water utilities. These issues have a crucial importance in the actual policy debates about unbundling the integrated utilities into separate entities, a policy which has often been supported by the ongoing reforms in the deregulation of network industries. This paper argues that the potential improvements in efficiency through unbundling should be assessed against the loss of scope economies. Several econometric specifications including a random-coefficient model are used to estimate a cost function for a sample of utilities distributing electricity, gas and/or water to the Swiss population. The estimates of scale and scope economies are compared across different models and the effect of heterogeneity among companies are explored. While indicating considerable scope and scale economies overall, the results suggest a significant variation in scope economies across companies due to unobserved heterogeneity. Using a panel of household travel diary data collected in Germany between 1997 and 2005, this study assesses the effectiveness of fuel efficiency improvements by estimating the rebound effect, which measures the extent to which higher efficiency causes additional travel. Following a theoretical discussion outlining three alternative definitions of the rebound effect, the econometric analysis generates corresponding estimates using panel methods to control for the effects of unobservables that could otherwise produce spurious results. Our results, which range between 57% and 67%, indicate a rebound that is substantially larger than obtained in other studies, calling into question the efficacy of policies targeted at reducing energy consumption via technological efficiency.